Potty training a single child is stressful enough – the tantrums, the toilet paper, the Turkish rug now covered in urine. But potty training twins is even more difficult. Twins compound joy in many ways, yet bodily functions isn’t one of them. It’s not double the pleasure; it’s only double the poop. And yet, it’s not impossible to potty train twins in a short amount of time. In fact, in some ways, it’s beneficial – the motivation of the double diaper bill might be all you need to grow determined in the fight against the doodie. Though everyone has an opinion on when children should ditch the diapers for good, there really is no perfect age: kids are ready when they’re ready (and not a moment sooner). If your children are demonstrating signs of readiness – they’re showing interest in the toilet, pooping on a regular schedule, or keeping their diapers dry – go ahead and give it a try. But, beware: never attempt to potty train during a time of transition (such as moving to a new house, getting a new babysitter, or bringing home a new sibling). Doing so sets you up for failure. It might be easier to potty train two kids at once, but this isn’t always possible. Twins are individuals though they may look alike and act alike. It’s possible for one twin to be ready when another twin isn’t. Boy and girl twins are likely to be on different readiness schedules. If that’s the case, don’t keep the ready twin in diapers waiting for the other one to catch up. Just divide and conquer, one child at a time. And if things go well, the less eager twin will show more interest when they see their sibling using a potty. A week or two before potty training begins, prime your children by discussing what will happen. You may want to read books about the potty or talk to them about why it’s used. You may address concerns or questions. Children fear the unknown: making potty training transparent will benefit you. You should also take the time to go shopping for new underwear, making a big deal of their “big kid” status. Aim to buy your children designs with their favorite characters – they’ll think twice before soiling the likes of Mickey Mouse. 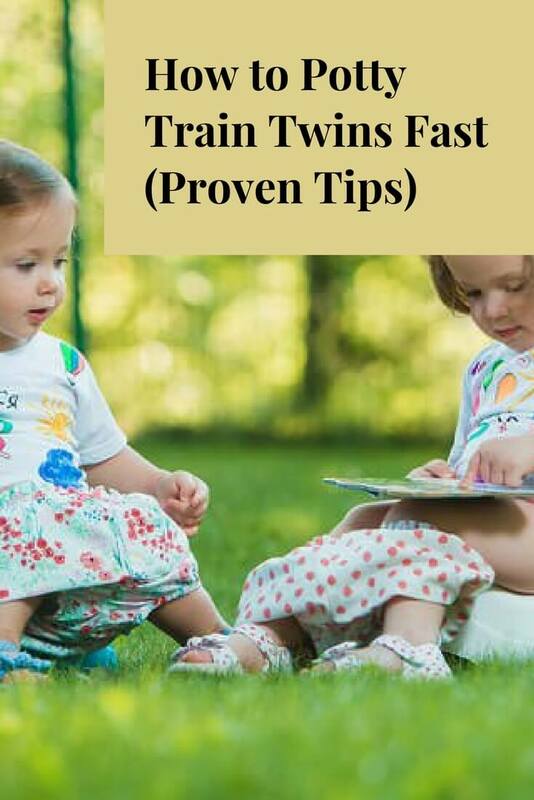 It’s possible that both your twins will be ready for potty training (this is more likely for identical twins), allowing you to train two for the price of one. The biggest benefit to this is sibling rivalry. Twins are born competitors and often exhibit this competitive spirit in any situation, including those that involve crap. If one twin poops in the toilet, the other twin becomes compelled to do the same – only his is bigger and smells way, way worse! However, this rivalry backfires on occasion. Twins have trouble escaping the idea that they’re twins and this leaves them striving for individuality. If one twin conquers potty training, the other might not simply in an act of defiance. If you see that happen, tone down the competitiveness and be patient. The twin who isn’t potty trained eventually puts individuality on the back-burner in the name of hygiene. They’ll return it to the forefront when they get their nose pierced in middle school. No article on potty training is complete without the mention of wonderful rewards: it’s a staple of parenthood, as you know. Yet, not every reward work with twins. If one twin gets a present for peeing in the potty and the other gets nothing for peeing in the pants, a sticky situation may occur. Not all children connect their actions with consequences. Thus, you run the risk of looking as though you’re playing favorites. Instead, whenever one child uses the potty, make a big deal about it – cheer, chant, perform an interpretive dance. Allow both children to participate in your celebration. That assures that both of them will want in on the fun (and in on the concept of toilet training). Twins are often saddled with presents and things they have to share – “Thanks for the hat, Grandma. We can’t wait to take turns wearing it.” A toilet isn’t something that works on a communal level when potty training. Each child needs their own potty, something they view as theirs and, as a result, want to crap inside. While twins will learn to potty train at their own rate, syncing them up will help keep you sane. The way to do this is to encourage joint bathroom trips: when one twin has to go, encourage the other to go as well. This will prevent you from taking one twin to the toilet and, five minutes later, having to take the other. It’s extremely common for kids to take to the potty to pee, but to prefer to do their pooping elsewhere: like on their bedroom floor. Some children are afraid of sitting on the toilet for long periods of time. If you’re bowled over by bowel movements and struggling to get your children to do number two in the loo, refrain from returning to diapers. Doing this will only make your children regress further. Rather, try to understand your kids’ perspectives, and work to remedy whatever problem they’re having. Normally, sticker charts are a mainstay of toilet training – they make for the perfect prop. But, with twins, they also reveal failure on the part of the sibling who is slower to learn. They act as a visual reminder that one twin is better at potty training than the other. And this results in damage – nix the sticker charts: you’ll save on therapy down the line. It’s only natural to want to compare twins to each other, but it doesn’t benefit anyone (especially not the twins). Refrain from relying on comparisons (i.e., “Your sister is using the toilet, why can’t you?”), and keep things positive. Use achievements by one twin to motivate the other. Sticking to the basics is important when toilet training twins because of the extra work involved – deviating opens yourself up to a longer learning process. So, remember to stay on schedule (encourage your children to use the potty consistently); be flexible (what works for one twin might not work for the other); dress them in easy-to-access clothing (stay away from the onesies that require you to set aside fifteen minutes to open the twenty-six snaps); and expect a mess (as mentioned above, it’s double the poop). Let your kids run around naked: Naked time removes the security of a diaper and teaches your children how to control their bladders. Watch for cues: Most kids show signs that they need to use the toilet. Take notice when they hold themselves, squirm, or jump around. Don’t punish or shame: Punishment and shaming are enemies of potty progress. Take a break: It’s always possible that you started too early – if you don’t see any progress, take a break. Then recoup, recover, and reconquer again. Most children take to daytime potty training before their bladders can make it through the night – the brain to bladder connection requires time to develop: up to fifteen percent of five-year-olds have accidents when asleep. Be prepared for this with nighttime diapers. Use them until your children awake dry, day after day – then it’s safe to go without. Parenting any child is hard; parenting twins ups the ante – there’s no way around it, twins outnumber you. And potty training multiples is one of the most difficult tasks. But it’s also one where you’ll feel great self-satisfaction afterwards. Potty train your twins, and then go and climb Mount Everest.